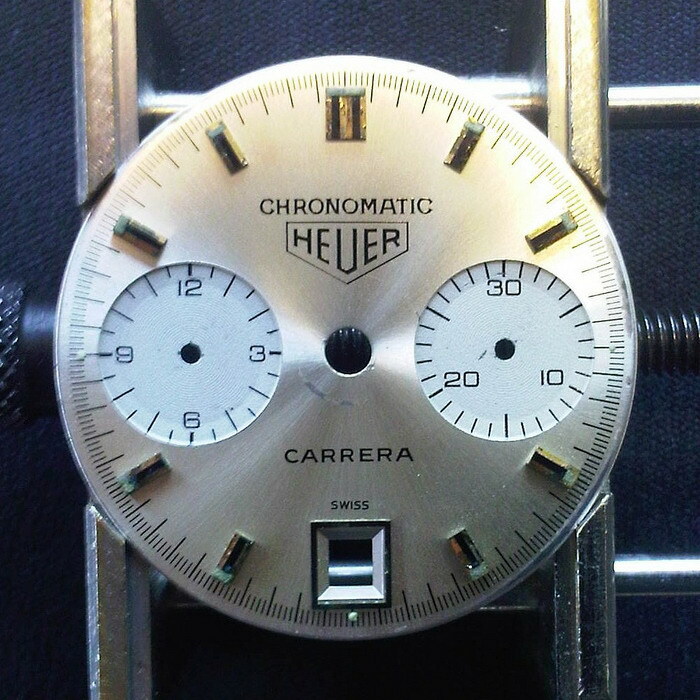 On November 3, 2011, Rich Crosthwaite — one of our Monaco experts — posted a message on our discussion forum regarding the Carrera Chronomatic dial shown immediately below. While our community had seen a handful of Chronomatic Carrera chronographs, all these had a gray-blue dial, with white registers, we had never seen a Chronomatic Carrera in the white-on-white design. A remarkable discussion followed, on our discussion forum, with several members of our community debating the origins, purpose and authenticity of this dial. I took a while to look at this one, digest some of the valid points that people have come up with and see what I really thought of it. Jeff is already familiar with my concept of the “known unknowns”, a (mental) list of watches I keep that I have never seen in the metal, in a photo, or in documentation, but I have reason to believe may exist. As opposed to an “unknown unknown”, which would be a complete surprise of a watch. Some of the known unknowns have since appeared – the 2447 NT first execution and 1153 S ‘Yachting’ spring to mind. One of the watches on there is an 1153 Chronomatic in silver. 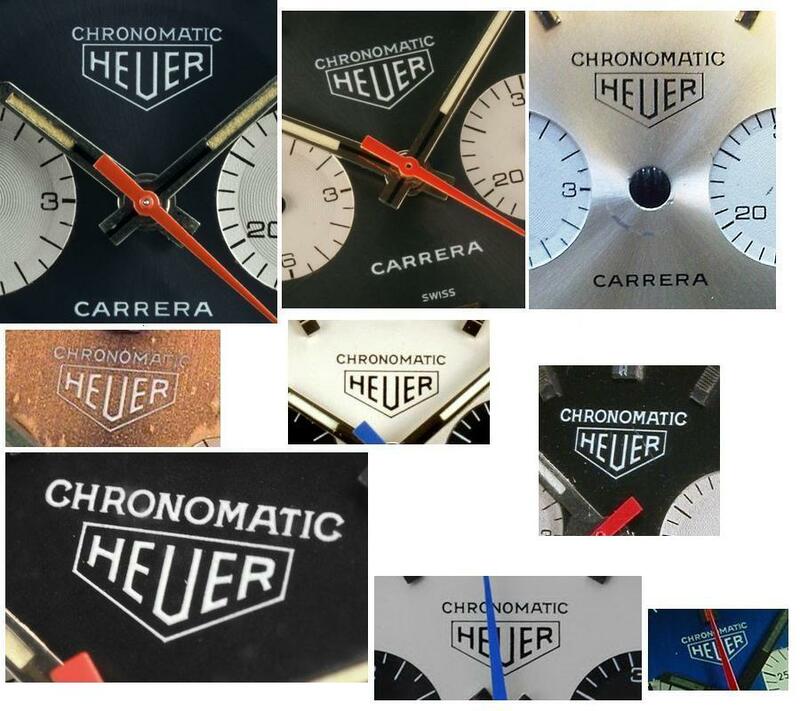 I have seen sales documentation stating the Carrera Chronomatic was available in charcoal and silver, but it was from a third-party rather than Heuer themselves. 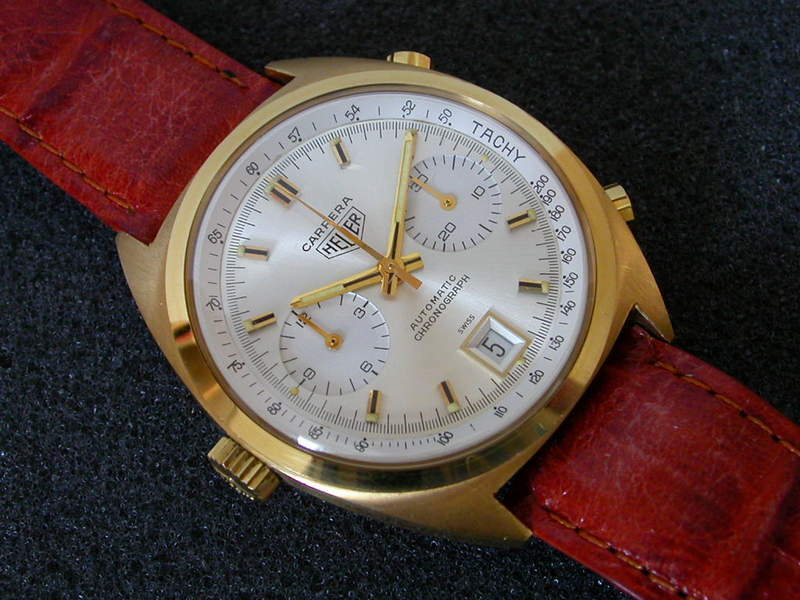 Nonetheless, I believed (and continue to believe) that there is a good possibility that the Carrera with Chronomatic marked dial was available in both N and S versions. Not to do so would have broken with a long standing Carrera tradition and run contrary to the Autavia, which had less history of silver/white dials before the Siffert. I also entertained the possibility of an 1158 with Chronomatic dial, but that felt a bit less likely. On the basis of the earliest watches and catalogues, I suspected that if an 1158 Chronomatic did exist, it would most likely have the silver dial. Plus the Singer marking is correct, as Paolo also notes. Some people have noted that it’s not a good fit for the Chronomatic 1153 Ns we know of. I would agree, there are a number of differences against those dials. 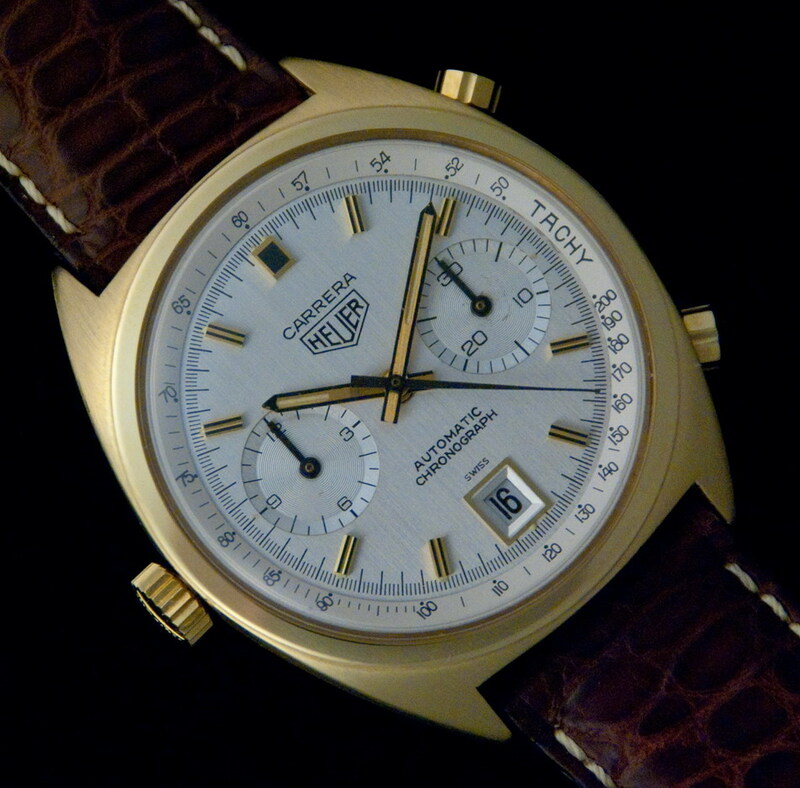 Not a good match against the Monacos or the Autavia 1163 T either, look where the “Chronomatic” text on those lines up against the Heuer shield. And then…. and then we come up against the Autavia 1163 MH. Very different script on those compared to the 1163 T. The text is wider, with the C, h, i and c all being more or less outside the width of the Heuer shield. The Cs are nearly closed, with elaborate serifs. The first O is slightly oval, the second more round, unlike the other Chronomatics where both Os are more distinctly oval. And we see all the same things on this “new” Carrera dial. Which bodes well for originality – we have no other 1158 Chronomatics to compare it against, but we can see echoes in a sister model. I’m not sure why there are comments about it not being mounted on a watch. It clearly has been. There are marks where the hands have been removed, wear from the tachy bezel and marks on the reverse where it has been mated to a movement. Whether this was in 1969 or subsequently is impossible to tell, but I would say if has definitely been part of a watch at some point. None of those scream to me prototype dial, not intended for sale. Clearly the registers are finished in the same silver as the rest of the dial. The other Chronomatic dials didn’t have a metallic finish on the registers but that shouldn’t have been a problem for Singer – they had supplied silver starburst dials with silver registers for the launch of the Carrera in 1964 after all. But these white ones don’t look to have been ground down and refinished – the ridges are still clearly visible. 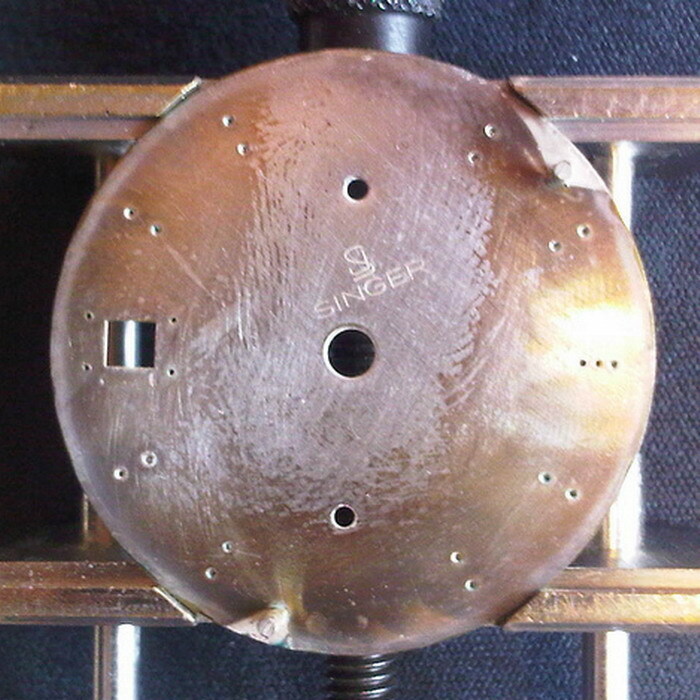 Let’s remember how these chronograph dials are typically constructed though. They are a series of plates pressed together in a sandwich, allowing for the registers to have this recessed look and easily to be in a different colour from the dial itself. can we be entirely sure that one doesn’t have white registers too? Hard to be sure from the photo, but I wouldn’t rule it out entirely. You’ll note that both early dials have a radial starburst finish rather than the vertical brushing of later watches too. Paolo, as you have tracked down the owner, do you think he could confirm for us whether that example has white or silver registers? And Rich, can you confirm the colour of the date window surround? All considered, I’m definitely leaning towards genuine. Will be interesting to see the replies to my two queries above.